The blurb tells you the story and that's exactly what you want. The trick is to find more inside than on the cover and Katherine Addison does that. I gave this 4 stars because I found a lacking of background. I wanted to know why Goblins were less than elves at least to some, why the government is set up the way it was and lots of other questions not answered from reading. None of this of course is important to the story. 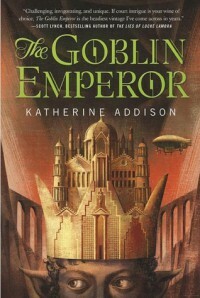 Addison was able to bring to life a young goblin and drop him not so gently into palace politics, just as the blurb described. We feel sorry for Maia and understandably so, and we watch him grow into the role as emperor rather quickly truly but again I felt this is where more could have been told. I do hope there is a sequel but the way the story ended I doubt it because Maia has become his own man. Addison's writing was flawless and the dialog seamless even with the royal plurals used throughout. A little lacking with some background descriptions but not horribly so that I couldn't imagine where the story was taking place. This would make an excellent movie, made for tv movie anyway and I do recommend reading it and her other works under her real name, Sarah Monette.